The cloudsare parting on Venus as new images reveal more about the structure of a denselayer that enshrouds the hot planet. The cloudyveil allows a small amount of sunlight to reach Venus' surface but then traps in that heatlike a greenhouse, causing temperatures at the surfaceof Venus to soar to about 870 degrees Fahrenheit (465 degrees Celsius). While pastVenus missions have revealed information about the clouds, astronomers havelong wondered about a puzzlingphenomenon seen when looking at them in ultraviolet light. Certain regionsshowed darker spots, which means some chemical in the clouds in those spots wasabsorbing the UV light and making the area appear dark. New imagessuggest mixing between the lower and higher clouds occurs in some areas on theplanet and not others, which would explain the dark and light spots. The study,which relied on data collected by a camera and other instruments aboard theVenus Express spacecraft, brings scientists closer to figuring out themysterious cloud chemical. While the study scientists still can't identify thechemical, they have figured out the process that causes the changes in cloudtypes across Venus. Theresults, detailed in the Dec. 4 issue of the journal Nature, could alsohelp scientists as they study the roaring winds on Venus, which drive cloudmovements. The VenusExpress researchers, led by Dmitry Titov of the Max Planck Institute for SolarSystem Research, found that along the equatorial or tropical regions of Venusthe cloud tops (the upper edge of the clouds) were full of that mysteriouschemical and so appeared as a dark band in the UV images. By using infrareddata, the researchers could map out the temperature in that same region. Theresults showed that like boiling water, the material at the cloud tops had movedupward from below due to convection. 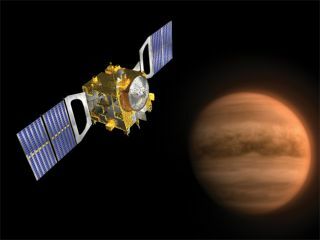 "Thesun heats the atmosphere at the equator and the atmosphere starts to boil ormix vertically," Titov told SPACE.com. "It comes from thedepths of the cloud. It's continuously brought to the top of the clouds by thisconvective activity." At themid-latitudes, Titov and his colleagues found a bright band of clouds in the UVimages, suggesting these clouds are full of sulfuric acid. The cloud tops inthis region were also much colder than those in the Venus tropics. Titovexplained the chilly upper layer at mid-latitudes acts like a barrier andprevents vertical mixing that would otherwise bring material up from below. The newVenus Express data also showed the clouds in both the equatorial andmid-latitude regions extend to 45 miles (72 km) above Venus' surface. Theclouds begin at about 31 miles (50 km), making for a 12-mile (20 km) thickcloud layer. But nearthe planet?s south pole, where a giant hurricane-likevortex swirls, the cloud tops were much lower, only extending to analtitude of 40 miles (64 km). Titov said the whirling vortex is likelyresponsible for the lower clouds at the south pole.